Writing from Los Angeles, Michael Potts reports for the Indian economy daily on the NSF grant to a project led by UCI's Sharad Mehrotra and UCSD's Ramesh Rao, division director of Calit2. The system being planned "will help agencies communicate and share information quickly in an emergency crisis," he reports. In its online version, the publication notes that UCSD researchers will get over $14 million from the NSF to fund information-technology research projects on the campus. Some $3.5 million of the total will go to research led by Calit2 division director Ramesh Rao for a joint project with UC Irvine on IT for emergency response. In the October 6 issue of the Orange County Business Journal, technology reporter Andrew Simons writes about UCI hiring Albert Yee as director of California Institute for Telecommunications and Information Technology. Simons says that Dr. Yee is the second professor UCI has hired away from University of Michigan, a top 20 engineering school. "Huntington Beach and Newport Beach are ground zero for these efforts," said Stanley B. Grant, professor of environmental engineering and chairman of the department of chemical engineering and materials science at UC Irvine. Grant conducted several studies on the bacteria problem, including an examination of the bacterial flushing from Talbert Marsh, a reclaimed wetlands area along Pacific Coast Highway in Huntington Beach that drains into the ocean. "We know there is no natural source," he said. "Weird things happen and you don't understand why." In its Oct. 3 issue, the magazine's writer Jocelyn Kaiser reports on the NIH's new "roadmap" for transforming the way the biomedical giant does business, and quotes "computational scientist Larry Smarr of UC San Diego," who notes that the plan is "very much in line" with a recent report from the National Academies that calls for putting at least 5% of NIH's budget into transinstitute initiatives. "I think there will be strong support from the field," Smarr is quoted as saying. The National Science Foundation will award $9 million to the University of California's Irvine campus, and $3.5 million to the San Diego campus to develop information sharing tools and organizational strategies for first responders. On Sept. 22, SDSU’s Immersive Visualization Center demonstrated the use of different communications technologies to enhance homeland security efforts in the San Diego region. The event was held in part to increase public and media awareness of countywide terrorism preparedness efforts. In the daily newspaper's lead story, technology writer Jennifer McEntee reports that "a bird's eye view of the new [Calit2] facility was part of a daylong open house, expo and conference at the UCSD campus... By the end of 2004 or beginning of 2005, it will be a 220,000-square-foot research space featuring clean room environments, a wireless laboratory and media labs." Quoted are institute director Larry Smarr, division director Ramesh Rao, and Jacobs School dean Frieder Seible. "News From U.S Rep. Christopher Cox"
LA Times Staff Writer Claire Luna covers the NSF award in today's Orange County section interviewing UCI professor Sharad Mehrotra and the head of NSF's computer and information science and engineering team." Marla Jo Fisher reports on Calit2 at UCI receiving one of NSF's largest collaborative research awards in the amount of $12.5 million, for a five-year project to develop new methods for collecting, analyzing and disseminating disaster data to decision makers and the public." Writer Heather Havenstein reports in the publication's Aug. 25 edition on renewed interest in video technology for surveillance and first responders. UCSD professor [and Calit2 layer leader] Mohan Trivedi "is spearheading research funded by the Defense Department to study Distributed Interactive Video Arrays, a system linking multiple cameras that track people or objects as they move." Trivedi is also reported as saying that "digital video is ideally suited for first responders because it can provide multiple views of a situation." Neil Morgan reports that "it's not a trade show but an all-day paean to the evolution of information technology: On Sept. 24 at Price Center, Larry Smarr's UCSD division of Calit2 unfurls its latest Unbelievables." 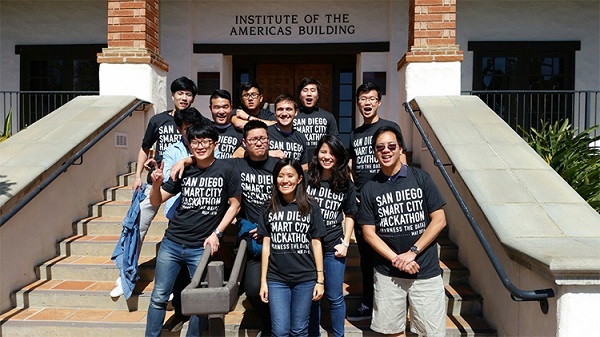 In its Sept. 1 edition, the weekly reports that "the California Institute for Telecommunications and Information Technology at UCSD will showcase its research at an all-day conference and open house in late September... More than two dozen UCSD faculty will make presentations on current and future technology." The newspaper notes that Calit2 is participating in a new project called FWGrid, funded by NSF with $1.8 million "to implement an advanced computer and telecommunications network" in UCSD's new Computer Science and Engineering building, which is now under construction. CSE professor and FWGrid principal investigator Andrew Chien is quoted. The study of video games -- combining computer science, art, and sociology -- is often masked by euphemisms such as "interactive media" or "digital arts." Off to college to major in ... video games? Celia Pearce of Calit2 new media arts layer comments on video games as a new college major in the Christian Science Monitor. "Off to college to major in ... video games?" "Down the Road, Portable Power; Hydrogen hailed that leadership, from Calit2, to the [San Diego] Supercomputer Center, to Irwin and Joan Jacobs' major gift to the UC San Diego School of Engineering." UCI researchers, affiliated with Calit2, received a $300,000 grant from the Defense Advanced Research Project Agency (DARPA) to research nanotechnology for wireless communications. Writer Brian Robinson reports on how application developers are learning to adapt to the constraints of first responders. He showcases work at UCSD, and quotes Calit2 division director Ramesh Rao as saying that since "first responders use speech a lot... that's a natural interface to exploit." "The Chronicle of Higher Education"
Can Grand Theft Auto Inspire Professors? Down the Road, Portable Power; Hydrogen hailed as fuel source of the future" Since then, "it's been a frenzy, or you could call it a stampede," said Scott Samuelsen, director of the National Fuel Cell Research Center at the University of California, Irvine. The Web version of Corporate Social Responsibility news service reports that "eHelp(TM) Corp., the makers of RoboHelp(R), announced the commencement of its Academic Software Donation Program, committing a total of $12,000,000 worth in RoboDemo(R) eLearning Edition tutorial software to accredited colleges and universities." The first recipient is UCSD's Sixth College, through Calit2, and Sixth provost Gabriele Wienhausen is quoted as calling RoboDemo "a tremendously valuable program." Interviewed in Today@UCI, Calit2's New Media Arts Layer Leader at UCI, Simon Penny, believes society is on the edge of a change as resounding as the Industrial Revolution. He sees the emergence of a digital culture that blends art and technology into new social practices only now being imagined by Penny and others in his field. In the newspaper's weekly Circuits section, Jeffrey Selingo reports on efforts to update the system of Internet Protocol addresses now that "new technology is draining the stockpile" of addresses. He reports on the recent IPv6 global summit co-sponsored by Calit2, and quotes director and Jacobs School computer science and engineering professor Larry Smarr as well as Calit2 Scholar Alex Lightman, who organized the conference. Technology writer Steve Lohr reports on the origins of Grid computing at a 1995 supercomputing conference in San Diego, and quotes Calit2 director and CSE professor Larry Smarr as recalling it "was the Woodstock of the grid — everyone not sleeping for three days, running around and engaged in a kind of scientific performance art." Also quoted: UCSD neuroscientist Mark Ellisman, director of the Biomedical Informatics Research Network, who says that "we're helping a scientific community to understand that it does more good to make information more generally accessible than squirreling it away." Technology writer Donna Howell reports on Pentagon plans for rapid deployment of the next generation of Internet protocols -- IPv6 -- and quotes Calit2 director Larry Smarr as saying "I think you're going to see IPv6 adopted faster than some people thought it would be." Also quoted: Calit2 Scholar Alex Lightman, who organized the recent IPv6 Global Summit co-sponsored by the institute in San Diego. Game Culture & Technology Lab Associate Director for Research Walt Scacchi is featured in story about approaches for discovering free/open source software development processes in projects like NetBeans. In a reference to the ActiveCampus project led by Jacobs School computer science professor and Calit2 layer leader Bill Griswold, the British newspaper notes that at UCSD "students have location-enhanced buddy lists to show them where their friends are on campus." Special correspondent Neil Alger interviewed San Diego Supercomputer Center director Fran Berman, an academic participant in Calit2 and computer science professor at the Jacobs School. In it, she warns that "there has been considerable underestimation of the level of difficulty of the problems that one must address in order to deploy the most sophisticated vision of the grid. Brett Hanavan Baldridge reports that in the wake of increased security concerns, UCSD scientists led by Jacobs School professor Mohan Trivedi "are developing an automated system to detect and track faces in a crowd, and to better monitor large areas where people gather and areas sensitive to intrusion." Funding for the study comes from a federal agency, The Technical Support Working Group (TSWG) under the Department of Defense. Technology writer Bruce Bigelow reports from the Calit2-sponsored IPv6 Global Summit in San Diego, that "the Department of Defense has moved to reassert its enormous influence in the development of information technologies" by throwing its weight behind the new Internet Protocol version 6. Calit2 director Larry Smarr is quoted as saying the Pentagon announcement is "a real wake-up call for every U.S. vendor that sells to the DOD." In his June 19 tech column, Fred Reed reports that there is big money in anti-terrorism, including federal grants for research. He notes that the Pentagon "has given a contract to the Computer Vision and Robotics Research Laboratory at the University of California at San Diego to develop... interlinked cameras, connected to computers, [that] would recognize suspicious activity, like a car stopping by the fence surrounding a sensitive installation." Writer Vikas Bajaj reports on the first deployments of Dallas-based Chiaro Networks' Enstara router, noting that "researchers at the California Institute for Telecommunications and Information Technology are using the router to study what new applications could be created if networks had many times their current capacity." Speaking for Calit2, SDSC's Phil Papadopoulos calls the router "an extremely flexible system for us to undertake our research objective." Christine Carrillo of the Daily Pilot reports fro Irvine on computer science students showing "their work -- videogames." Students of Information and Computer Science professor Dan Frost, a Calit2 academic participant, developed their own videogames during a 10-week course. In its high-tech news section, the weekly reports that "UC San Diego has an 18-month, $600,000 anti-terror grant from the federal government to develop an automated system for detecting and tracking faces in a crowd." Mohan Trivedi, a professor at UCSD's Jacobs School of Engineering, leads the research team. In the cover story of Mizzou's summer edition, the magazine of the University of Missouri Alumni Association profiles Calit2 director Larry Smarr, an alumnus who is "behind the scenes, ahead of the pack" and helping "set high-tech's learning curve." Smarr received both his AB and MS from the university. The newspaper reports on the $5 million grant to the UCSD Stroke Center, Jacobs School and Calit2, which will allow physicians to "utilize a new ultrasound-screening tool and provide remote consultations via wireless technology, in an effort to increase the number of stroke patients receiving more timely treatment." Staff writer Melissa Baniqued reports on the $600,000 award to UCSD's Computer Vision and Robotics Research laboratory "to continue developing technology for an automated system designed to fight terrorism by detecting and tracking faces in a crowd." The principal investigator on the project is Calit2 layer leader Mohan Trivedi. Writer Kari Dean reports on distributed digital video arrays (DIVAs) being developed by Calit2 transportation layer leader Mohan Trivedi, at UCSD, who recently was awarded a $600,000 grant from a Defense Department working group "for further development of DIVAs, cameras that see, think and communicate." Technology writer John Markoff reports on a new push to shift the focus of supercomputing centers from computing, to data storage, and quotes Calit2 director and CSE professor Larry Smarr as agreeing with the basic thesis and saying that rapidly increasing network speeds would make it possible to increasingly distribute computing tasks. In its regular Monday Q&A column, the newspaper quotes Microsoft chairman Bill Gates' responses to questions from students at the Jacobs School and UCSD's charter Preuss School, covering subjects ranging from "his taste in music; how well he knows Mircosoft's products; what we can expect from the next version of Windows; and what matters most to him in life." Marla Jo Fisher and Bill Rams report on UC Irvine's Premiere Homeland Security and Defense Seminar. The seminar brought together professionals and researchers from across the country. In his column, Neil Morgan reports that Bill Gates told some 1,500 UCSD students that Microsoft uses university research as a model "instead of the corporate model... We felt the best way to expand the state of the art is to hire great researchers and give them the freedom to innovate with a minimum of bureaucracy." He also noted that before the student forum, GatGates has praise for university research model"
es met with Calit2 director Larry Smarr, who -- along with former SDSC director Sid Karin -- "prodded the National Science Foundation into creation of the first supercomputer centers in 1985." Technology writer Jennifer McEntee reports on Bill Gates' speech to UCSD students and the question-and-answer session, with Calit2 director Larry Smarr posing questions from students. She quotes Gates as predicting "the really interesting software is the software that will be written in the next decade. This is not a mature science." For a recent piece on its website, AT&T Research showcased the beginning of a new relationship with universities, "and the first program to get up and running is with the UCSD." According to the release, "First, it will support faculty and graduate-level research that leads to innovations in the area of IP measurement for network reliability. Second, it will generate collaborations between UCSD and AT&T researchers, through working with students. In a bylined article for the June 2003 issue, CSE professor and Calit2 director Larry Smarr writes about nanospace as "the new space race... the battle for more and more control over less and less." "I have seen the future, and it is small," he writes, and concludes that the scientists and engineers working in the nano arena of the future will be "masters of bioinfonanotech." In his Sunday column, Neil Morgan notes that Microsoft founder Bill Gates will give a lunchtime talk at UCSD's Price Center on May 27, hosted by Calit2 director Larry Smarr. Morgan notes that when Gates was asked whether he wanted to see Smarr's bio, the email response was: "Don't bother. Everybody here knows about Larry Smarr." In a feature showcasing various Calit2 projects and "the convergence of wireless and broadband," the quarterly publication of the Corporation for Education Network Initiatives in California (CENIC) quotes institute director Larry Smarr and other researchers. (Smarr delivered the keynote address to CENIC's annual meeting in 2002.) Also in this issue: features on two other California Institutes for Science and Innovation (CITRIS and QB3), and a cover story on a breakthrough in 3-D imaging at the San Diego Supercomputer Center. As posted in the online magazine Salon.com, AP reporter Jim Paul quotes Calit2 director Larry Smarr on the impact the Mosaic web browser had on the Internet. "It was an accelerator for the whole Internet," said Smarr, the former director of the National Center for Supercomputing Applications (NCSA), where Mosaic was developed. Writer Sherry Parmet reports on moves by local colleges and high schools to teach computerized art, and quotes UCSD professor Sheldon Brown as saying "artists were some of the first people to jump onto the Internet." Brown is the director of UCSD's Center for Research in Computing and the Arts (CRCA), and leads Calit2's New Media Arts layer at the university. Writer Greg Kline looks back at the development of Mosaic, the first Web browser, ten years ago, at the University of Illinois supercomputing center. The story quotes then-NCSA director [and now Calit2 director] Larry Smarr. In part two of his special report, Greg Kline looks at the future of the Internet on Mosaic's 10th anniversary, quoting Calit2 director Larry Smarr as comparing the current state of things on a level with the development of the automobile before the highway system. "It takes decades to really build out a national, in this case a global, infrastructure," he said. GRIDtoday correspondent Neil Alger spoke recently with Dr. Andrew Chien, chief software architect for the Calit2-led OptIPuter project. "Body Electric", by UC Irvine's Simon Penny and Malcolm MacIver of Caltech, is featured as one of six installations in "Neuro", an art and science collaboration about how organisms and devices interact with their environments. The exhibit is jointly organized by the Center for Neuromoprhic Systems Engineering at Caltech and the Art Center College of Design. Penny is the Layer Leader for the New Media Arts in the Irvine Division of Calit2. In its April 5 edition, Australia's premier radio program about science profiles two Calit2-related projects. Host Robyn Williams interviews biochemistry professor Michael Sailor about smart dust -- tiny silicon sensors. (Transcript). Williams also talks with Jacobs School dean Frieder Seible [co-chair of Calit2's Governing Board] about new technologies to test and retrofit buildings to better withstand earthquakes and bomb blasts. According to an article on the website of HP Labs, the Hewlett-Packard unit will pursue new wireless technologies as part of a research partnership with Calit2, "one of the world's most prominent centers for wireless technology development. The high-performance computing online news service named Calit2 Chief Scientist Ron Graham to its annual list of 20 people and organizations, noting that "in his role at Calit2, Ron oversees research into optical computing and next-generation networking technologies." Also named to the 2003 list: the San Diego Supercomputer Center's Chaitan Baru, who heads up Calit2's Knowledge and Data Engineering Lab; and Alan Blatecky, the new Executive Director of SDSC. In the newspaper's Technology Inc. section, staff writer Bruce Bigelow profiles Jacobs School professor and Calit2 Chief Scientist Ronald Graham -- a mathematician who "coolly juggles scientific puzzles and six or seven balls." On March 9, columnist Richard Louv reported on "Shadow Bowl," an effort co-led by SDSU professor and Calit2 participant Eric Frost, which made San Diego "a national test case for regional preparedness in the event of a major terrorist attack." The newspaper's Jeff Ristine reports on work in the computer vision lab of Calit2 layer leader Mohan Trivedi, on the deployment of a network of omni-vision highway cameras, to help coordinate response to traffic emergencies. In its weekly Technology Inc. section, the paper notes that UCSD professor Truong Nguyen "will receive more than $200,000 over three years from Skyworks Solutions and a university-industry cooperative research program... to fund work that could lead to smoother video streaming on wireless handheld devices such as mobile phones and personal digital assistants." The grant is through Calit2. Science writer Bruce Lieberman reports that UCSD neuroscientist (and Calit2 participant) Mark Ellisman is leading BIRN -- an effort to coordinate a national computer network that could become a model for how scientific research is shared. Business editor Mark Van de Kamp reports that "Calient Networks Inc., which has offices in Goleta, San Jose and San Diego... will team with the California Institute for Telecommunications and Information Technology, involving the University of California and businesses, and the University of Illinois at Chicago, on development of the OptIPuter." "Calient Networks Chosen for Optiputer Project" The online news service reports that Calient Networks will supply its "all-optical switching system for the OptIPuter research project underway by... Calit2 and the University of Illinois at Chicago (UIC)." Calient's platform, it reports, "uses a single-crystal silicon 3D MEMS design." In a report on the use of computer modeling to understand what destroyed the space shuttle Columbia, writer Andrew Revkin quotes Calit2 director Larry Smarr saying "shuttle simulations are among the most verified codes in computational engineering."